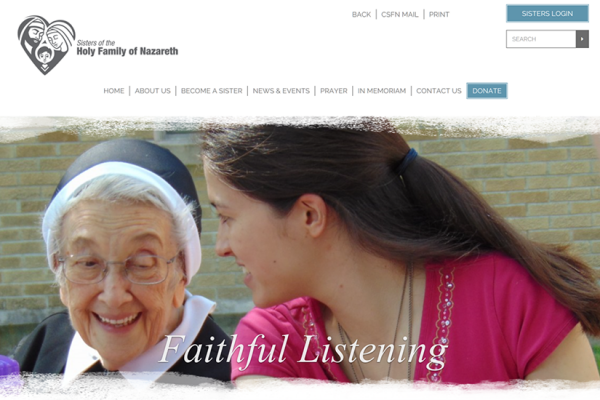 We are excited to introduce you, our friends of Nazareth, to our new website at nazarethcsfn.org. The new design incorporates an updated look with navigation menus and buttons to help you find the information you are seeking. Why is a website important? It is our virtual front door. As with any entrance into a home, we want it to be inviting. It must be something that welcomes faith seekers, vocation discerners, donors, associates and Sisters. From first glance, we want our front door to convey the message that we welcome families into the heart of our mission. With the launch of our new website this month, visitors to our virtual front door will see even more welcoming faces, which we hope they will associate with positive feelings about Sisters, the Church and their faith. While a virtual presence will never replace one-on-one encounters, we hope our website continues to be an essential source for you to learn more about us, our spirituality, our mission and our ministries. Our new website offers easy to use menus and buttons for you to request prayers, subscribe to our newsletters, make a donation, print the Holy Family Novena, find a sister, and browse our In Memoriam. We encourage you to explore the new website. Click and search. See what it will do and where it will take you on your faith journey.